A 36-year-old Hispanic female presented to the emergency department with worsening left lower quadrant pain of 3 days’ duration. She described the pain as intermittent, cyclic, and related to her menstrual cycle. The patient reported nausea and loss of appetite but denied emesis or changes to bowel movements. Patient admitted to menorrhagia and her menstrual period ended 3 days previously. Physical exam illustrated tenderness to palpation of the left lower quadrant superficially with no tenderness to deep palpation. There was a 1 × 3 cm area of chronic purplish skin changes with accompanying small nodules. The area was in line with her previous ceasarean delivery closure site. 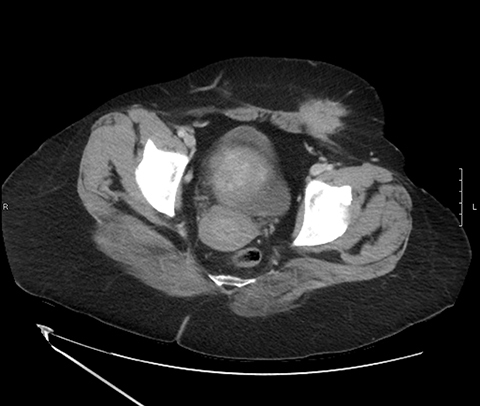 Patient’s complex of abdominal and gynecological complaints coupled with physical exam findings prompted computed tomography imaging. 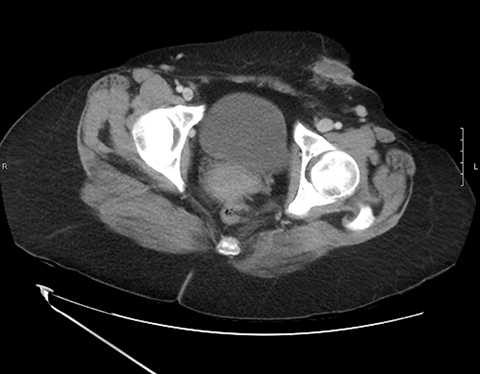 Computed tomography of contiguous axial images with sagittal and coronal reformats with contrast demonstrated a 2.5 × 3.8 × 3.5 cm speculated, soft-tissue mass in the left inguinal region with an associated 1.4 × 2.6 cm rim-enhancing, subcutaneous fluid collection at the inferior anterior aspect of the mass (Figures 1,2. 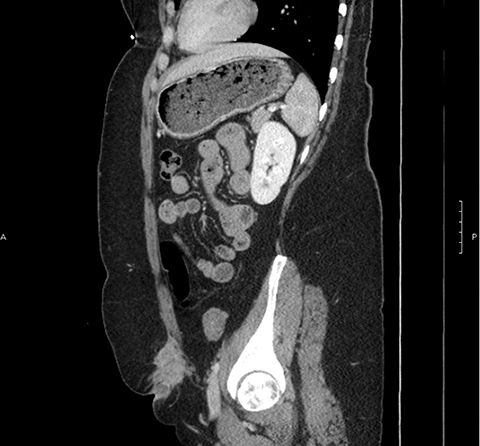 Intraoperative findings included a 6-cm cystic abdominal wall mass with old, dark hematoma fluid. Pathology report verified the tissue as benign fibroconnective tissue with multiple foci of endometriosis, consistent with an endometrioma. Given the wide variety of potential deposition sites of endometrial tissue, it is imperative to be aware of its malleable clinical presentation. Scar endometriosis. Differential Diagnoses: stitch granuloma, neoplasm, neuroma, hematoma, desmoid tumor, abscess, lymphadenopathy. Scar endometriosis is defined by the implantation or/and growth of endometrial tissue postsurgically at the incision site. These lesions are a product of gynecological or obstetrical surgery, including laparotomy and laparascopic approaches of abdominal and pelvic cases. Endometriosis typically presents as the embedding of endometrial tissue and glands in nonuterine locations such as the adnexa, cul de sac, GI organs and extremities. The incidence of scar endometriosis has been shown to be less than 2%,1,2 with the most common subtype being postcesarean section.3 Given the wide differential diagnosis and history of incorrect diagnoses, scar endometriosis should be evaluated for its clinical signs, with radiological assessment leading to its diagnosis. In addition to clinical signs, radiological imaging is key to accurate diagnosis and exclusion. Studies show CT, MRI and ultrasound to be reasonable options for diagnosing scar endometriosis.3 One study discussed sonography’s advantages of visualizing fistulas, tracts and vascularity, rendering it more accurate than CT, MRI, and FNA biopsy/laparoscopy which, in chronic cases, has led to misdiagnosis.5 Another study showed MRI superior in detecting scar endometriosis.6 A recent case series study suggested that transabdominal sonoelastography may be beneficial in further delineating surfaces, leading to more precise margin removal preoperatively. 7 While these results indicate there is no gold standard in initial assessment of suspected scar endometriosis, the advantages of each should be understood. The clinical picture and potential acute treatment needed for the differential diagnoses highlights the need to identify and comprehensively assess potential cases of scar endometriosis. Given the varied and recurrent clinical presentation of scar endometriosis, it is important to take note of its wide-ranging forms. Its increasing clinical prevalence emphasizes the need to further evaluate the most beneficial diagnostic imagine modality to guide appropriate management. Danielpour PJ, Layke JC, and Durie, N. Scar endometriosis, a rare cause for a painful scar: A case report and review of the literature. Can J Plast Surg. 2010; 18(1): 19-20. Mistrangelo, M., Gilbo, N., Cassoni, P., et al. Surgical scar endometriosis. Surgery Today. 2013; 44(4): 767-772. doi:10.1007/s00595-012-0459-43. Gidwaney R, Badler RL, Yam, BL, et al. Endometriosis of abdominal and pelvic wall scars: Multimodality imaging findings, pathologic correlation, and radiologic mimics. RadioGraphics. 2012; 32(7): 2031-2043. doi:10.1148/rg.327125024. Patel, N. Scar endometriosis: A sequel of caesarean section. J Clin Diagn Res. 2014; 8(4), 135-140. doi:10.7860/jcdr/2014/7554.4267. Francica G. Reliable clinical and sonographic findings in the diagnosis of abdominal wall endometriosis near cesarean section scar. World J Radiol. 2012;4(4): 135-140. doi:10.4329/wjr.v4.i4.135. Ozel L, Sagiroglu J, Unal A, et al. Abdominal wall endometriosis in the cesarean section surgical scar: A potential diagnostic pitfall. J Obstet Gynaecol Res. 2012 Mar;38(3):526-530. doi: 10.1111/j.1447-0756.2011.01739.x. Fawzy M, Amer T. Efficacy of transabdominal sonoelastography in the diagnosis of caesarean section scar endometrioma: A pilot study. Journal of Obstet Gynaecol. 2015;35(8):832-834. doi:10.3109/01443615.2015.1011107. Singh P, Singh M, Yoon JK, Chow B. Scar endometriosis. Appl Radiol. 2018;47(11):45-46. Prepared by Dr. Prapti Singh while an Obstetrics and Gynecology Resident at the UTMB Galveston, TX; Dr. Manu Singh while an Interventional Radiology fellow at Mount Sinai Hospital, Houston, TX; Dr. Yoon while a Faculty Radiologist and Dr. Chow while Program Director and Faculty Radiologist as Santa Barbara Cottage Hospital, Santa Barbara, CA.